Turkish Airlines and the Jordan Tourism Board Fam leave Dublin Airport. 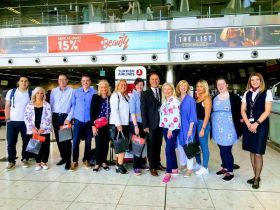 Onur Gull (Turkish Airlines) checks in and sees off the Turkish Airlines and Jordan Tourism Board Fam from Dublin airport where the group will fly on Turkish Airlines award winning service from Dublin to King Hussein International Airport in Aqaba. The itinerary will include a mix of seeing the new developments in Aqaba, as well as Petra and finishing in Amman. The group will have 4 full days in Jordan, the first two days will be in Aqaba, the third day exploring Petra and last day travelling back and looking around Amman. Ceara Monaghan, Aileen O’Reilly, Elyse Horan, Maura Carey, Richard Cullen, Roisin Carbery, Thomas O’Donohoe, Marian Benton, Katarina Trnikova, Sinead Daly, Alisa Isajeva and Anthony Leacy.